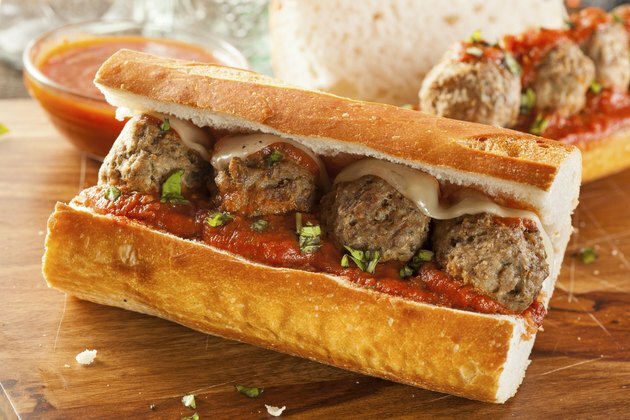 One of the hot sandwiches at Subway restaurant is a 6-inch meatball marinara sub. The sub is made with Italian meatballs in marinara sauce served with vegetables and condiments on a long roll. On the nutrition information page on the Subway website, the 6-inch meatball marinara sub is listed as having 580 calories. It also contains 9 g of saturated fat, about 60 percent of your daily recommendation if you eat 2,000 calories per day. This calorie count assumes the sub contains cheese and vegetables. Subway offers five different kinds of bread. For 6 inches of the bread, the calorie counts are: nine-grain bread, 210; hearty Italian, 220; honey oat, 260; Italian, 200; and Italian herbs and cheese, 250. Obviously, most of the calories in a meatball submarine sandwich do not come from the vegetables. Subway lists the calories for banana peppers, cucumbers, green peppers, jalapeno peppers, olives, onions and pickles as being less than 1 calorie for the serving size used on the meatball sub. If, however, you want to remove the tomatoes, that will reduce the total calorie count by 5 calories. Subway typically puts two triangles of sliced cheese on its subs. Leaving off the cheese will save you 50 calories if you typically eat pepper jack or provolone cheese and 40 calories if you typically eat processed American cheese.